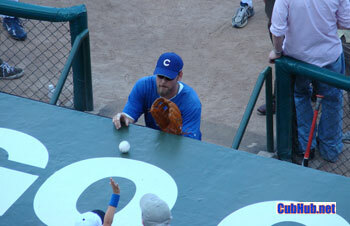 Kerry Wood quietly rolls a ball across the Cubs dugout to a young fan. Wood is a class act – he will be missed as his Cubs career came to an end yesterday. Great post…Kerry is indeed a class act, and he will be missed more than the Cubs brass realize – both on the field and in the clubhouse.